A non-radioactive replacement for thorium fluoride, ThF4, is now available. CIROM-IRX™ can be used for applications ranging from low-loss laser mirrors to filter and AR coatings. The material provides a refractive index of 1.4 near 10 µm wavelength and is compatible with other layer components typically used in IR multilayer coating designs. Coatings of CIROM-IRX™ show good adhesion and low stress for layer thicknesses at least twice the thickness of pure CeF3 films. CIROM-IRX™s manufactured as fully melted ingots at a very high temperature in a controlled atmosphere. The ingot is crushed and sized to lumps, granules or small grains, depending on customer application. Any required particle size range can be produced on short notice. The X-ray pattern of CIROM-IRX™ matches that of CeF3 but with an altered cell size. The material is over 99.9% pure. Clean the substrate surface thoroughly in an organic solvent such as acetone or xylene using cotton to scrub the surfaces. Rinse in alcohol before permitting the previous solvent to evaporate to dryness on the surface. Scrub lightly using cotton in Micro. Flush thoroughly in deionized water. Wipe with alcohol using cotton. Freon drying can also be used. Insert in vacuum tooling and begin pump down immediately. Under vacuum, a short, approximately two-minute period of glow discharge cleaning can be used just before deposition. For difficult adhesion cases, such as to ZnS or ZnSe substrates, apply a thin nucleation layer of Y2O3 or an equivalent binding layer. Y2O3 can be deposited to a thickness of ~100Å at a rate of 2Å/sec. in a vacuum of 1-2 x 10-5 Torr. A short period of low power sweeping of the E-beam is recommended to dehydrate and fuse the surface of the material charge. While sweeping, advance the power slowly to reach an evaporation rate of 1Å/sec. in a period of 5 minutes. Hold for about 2 minutes before opening the shutter. This is usually a sufficient time to eliminate outgassing and spitting. It has been found that this minimal preconditioning will completely eliminate spitting and outgassing during the deposition run and ensure a constant evaporation rate. The preconditioning step does not need to be repeated for subsequent runs. CIROM-IRX™ is best evaporated from a graphite crucible liner with a swept E-beam source operating at low power. A granule size of 2-3 mm is preferred. A steady rate of 20Å/sec. or greater can be achieved without the emanation of volatiles or spatter particles. The substrate temperature should be 225-250°C and the chamber pressure mid-10-6 to 1 x 10-5 Torr. The minimum substrate temperature is 150°C, and since film hardness will be sacrificed, low temperatures should only be used when CIROM-IRX™ is combined with materials requiring low temperatures, such as ZnS. Resistance heating from tantalum baffled box sources can also be used for evaporation. The charge should be discarded when severe discoloration appears. Layer thicknesses greater than 1 µm on germanium and glass substrates exhibit virtually no haziness. The refractive index is above 1.6 in the visible region, and the films are transparent from below 300 nm to greater than 11 µm. High rate E-beam or high energy ion beam deposition can cause the depletion of fluorine and result in some absorption in the UV region. Transparency is maintained to nearly 16 µm, but absorption begins above 11 µm. The mechanical durability and moisture resistance of CIROM-IRX* films are excellent. 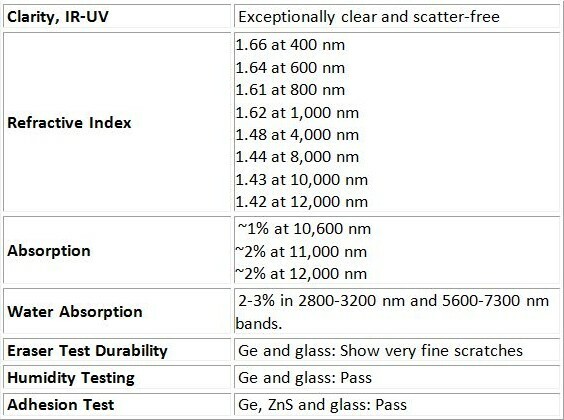 Film thicknesses up to 2000 nm have been grown on glass and germanium substrates without crazing or lifting. Thicknesses up to 1500 nm can be applied to ZnS and ZnSe substrates. View information about Materion thorium alternatives. We offer materials for evaporation as well as sputtering targets. CIROM-IRX™ is not radioactive and can be handled as any normal coating material. Proper safety precautions are always recommended, and inhalation of dust or vapor should be avoided. Disposal of coating wastes should follow established local and governmental regulations. NOTE: Facts pertaining to properties and processing parameters of CIROM-IRX™ were derived from published literature sources and testing. Although this information is believed to be correct, Materion does not guarantee its accuracy. CIROM-IRX™ is a Trademark of Materion.